Oxford University's women's boat crew have been rescued by an RNLI lifeboat in choppy waters in the Thames during training for the Boat Race. 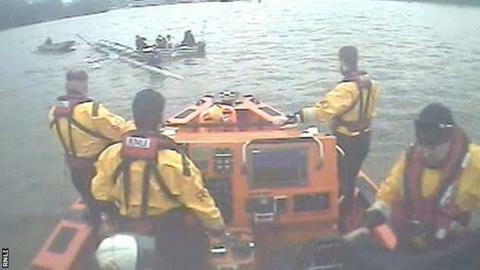 The eight rowers and cox were discovered by the Chiswick RNLI crew while it was out on exercise. RNLI helmsman Ian Owen said: "We've rescued quite a number of rowers, but it is the first time I've been involved in helping such a prestigious team." The men's and women's Boat Races take place on Saturday, 11 April. The crew later tweeted their thanks to the RNLI, adding: "Glad to say all athletes well and ready to go." Strong wind against tide had created the unsafe waters and three successive waves poured over the Oxford boats' riggers, creating an influx of water that could not be managed by the craft's water pump. The Chiswick lifeboat took the crew to Putney then the sunken eight was recovered and returned to Oxford's base. Helmsman Owen added: "The weather can be unpredictable on the Thames and the Oxford University team dealt with the situation as safely and calmly as possible." This is the first time that the women's boat race will take place on the same stretch of water and on the same day as the men's event. Oxford won the last race at Henley-on-Thames in 2014 by four lengths. The women's race has been contested since 1927, with the score standing at Cambridge 40, Oxford 29. Read more on Championship: Premier League spots at stake - who will go up?